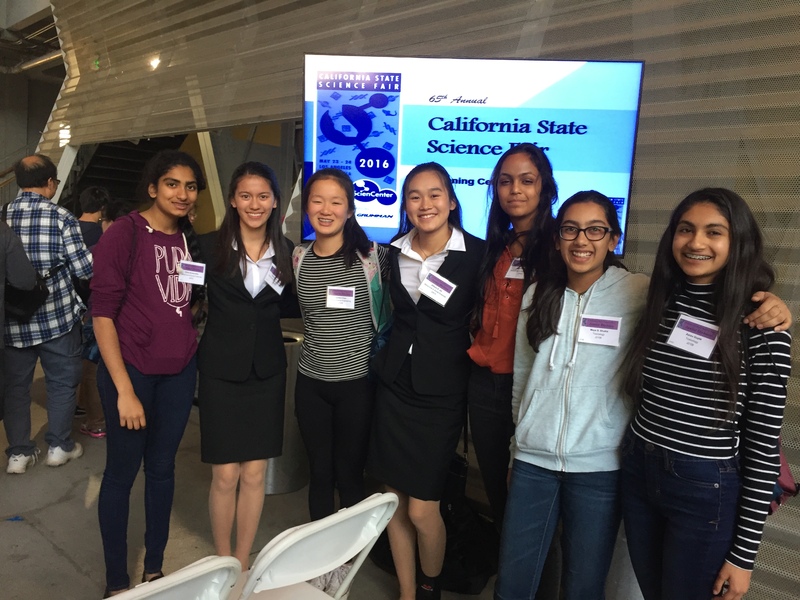 Three Harker eighth graders received accolades for their scientific research at the California State Science Fair, held in late May in Los Angeles. Cynthia Chen placed fourth in the environmental engineering category for her project, titled “A Novel Method to Reduce Water Consumption in Germinating Seeds.” The team of Aarzu Gupta and Maya Shukla received the Clinical Chemistry Award, which included a $150 cash prize, for their project, “A Test of the Mutagenic and Carcinogenic Potential of Nicotine-Free Electronic Cigarette Additives.” They also received a $100 second-place award from the UCLA Brain Research Institute. Other projects by Harker students displayed at the fair were “Effects of Emotions on Test Takers” by eighth graders Vibha Arramreddy and Sejal Krishnan and “Delicious or Disgusting? : The Effects of Priming on a Taster’s Reaction and Perception of Food” by eighth graders Allison Jia and Jasmine Wiese. This year’s California State Science Fair featured projects by 941 students from 421 schools across the state.